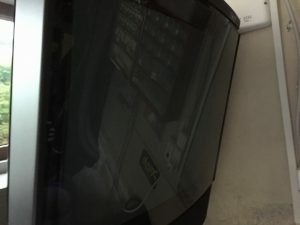 When switching on the machine, the screen showed no flickering nor was there any light in the power LED. 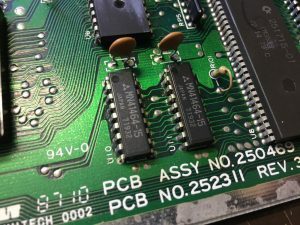 First I checked the power switch and no 5V was getting through to the board. 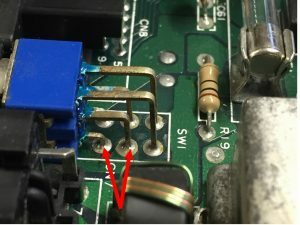 When flipping the power switch upward, these two legs should be shorted. 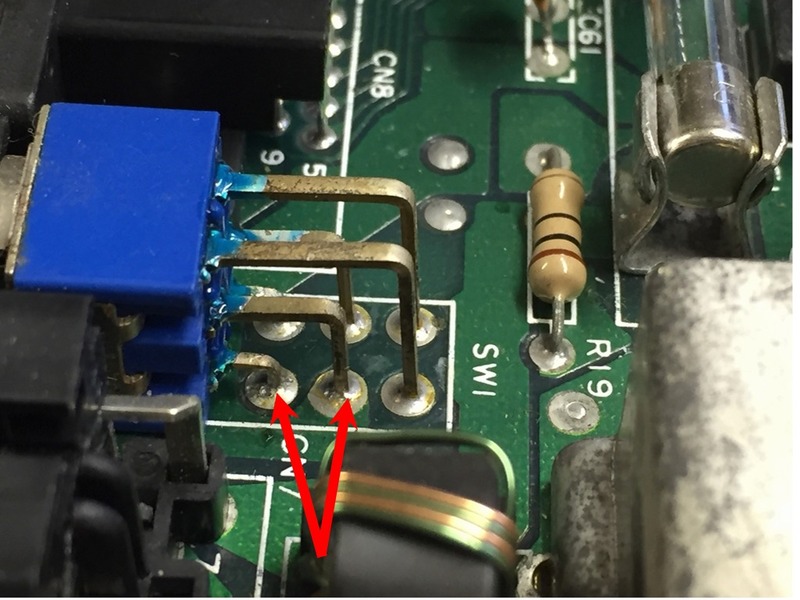 The broken power switch was removed and a fresh new one was installed. 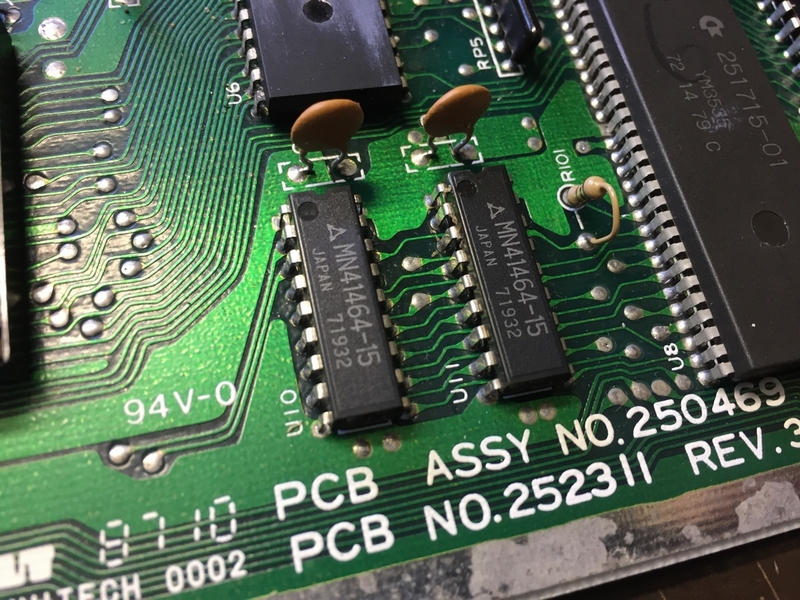 The board was now getting 5V and the power LED was lighting up again. 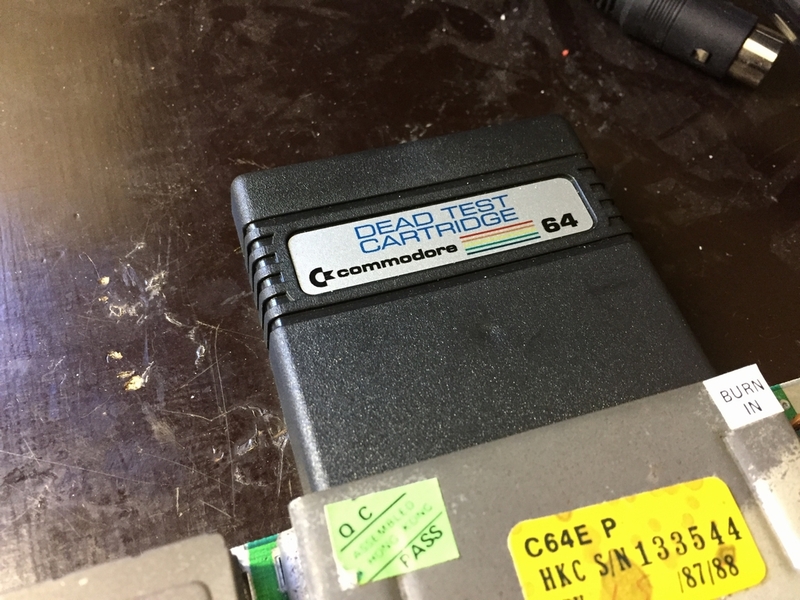 However, the black screen remained and none of my diagnostic carts (Dead Test Cart or 64 doctor) would shed new light on the problem! I then left the board powered on and started touching the different chips on the board to monitor any temperature changes. After about 10 seconds, the MOS 251913 chip at U4 (KERNAL/BASIC ROM) was getting extremely hot. 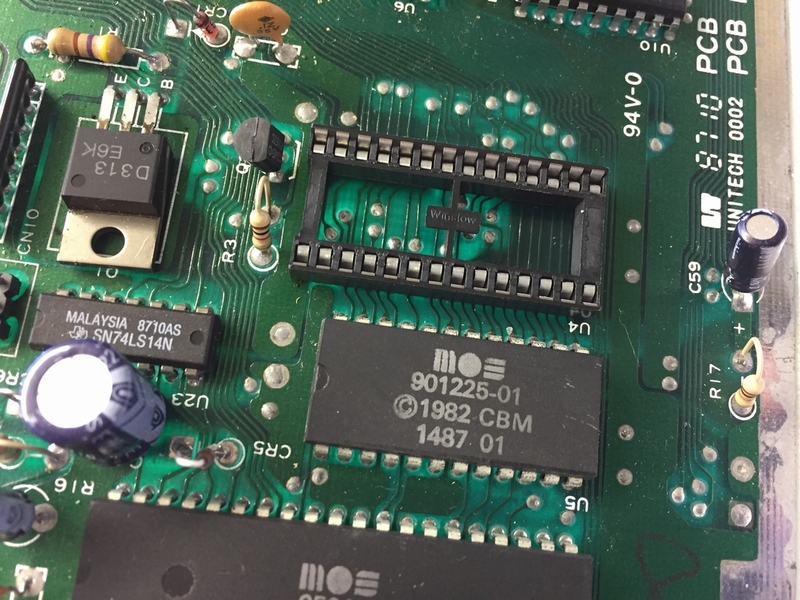 This chip shouldn’t get particularly hot so I assumed something was wrong with it and swapped it with a chip that I knew was working. 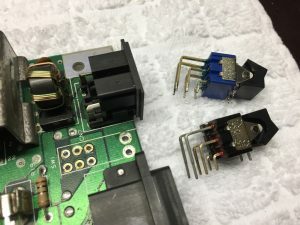 The new U4 CBM KERNAL/BASIC chip was not getting hot after powering on the machine. However, the screen was still black! 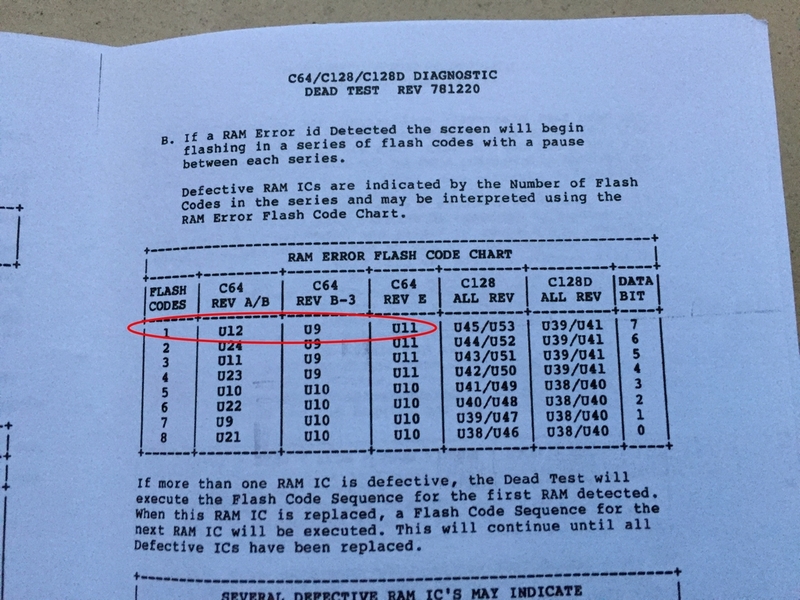 Popping in my Dead Test Cartridge made the screen flash once, indicating a memory fault on the RAM chip at U11. 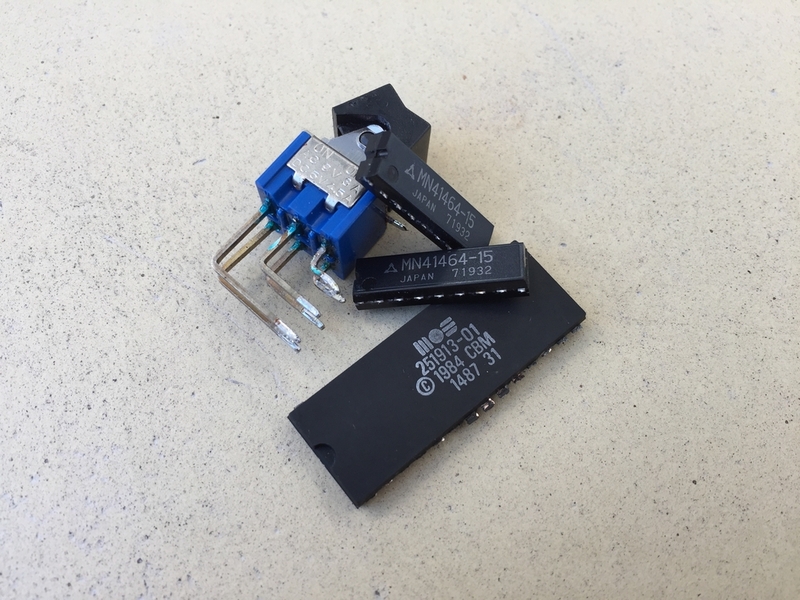 As the U10 RAM chip was also getting extremely hot (not U11), I first exchanged that chip with a fresh new one. 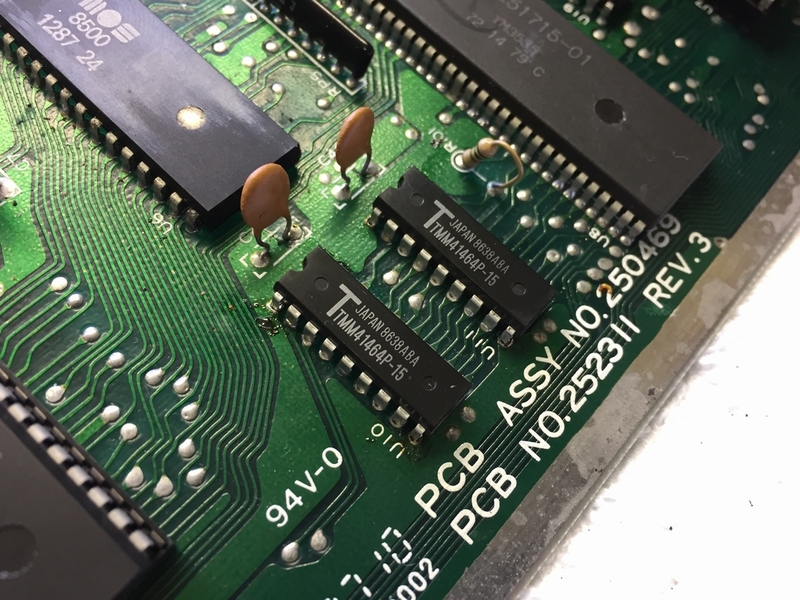 As I’d run out of 18 pin sockets I soldered the new RAM chip directly to the board. 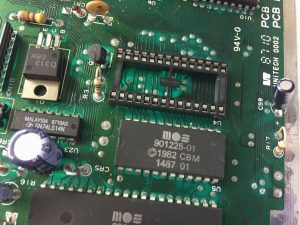 If I swap chips I always put in a socket as this makes swapping chips a lot easier if something else should happen to that particular chip in the future. 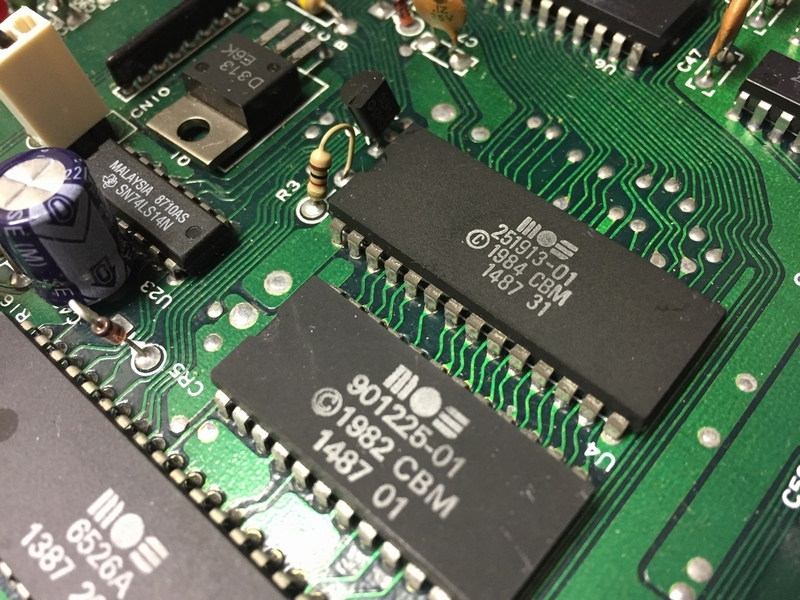 Unfortunately, the screen was still black and the diagnostic cart still pointed towards the memory chip in U11. 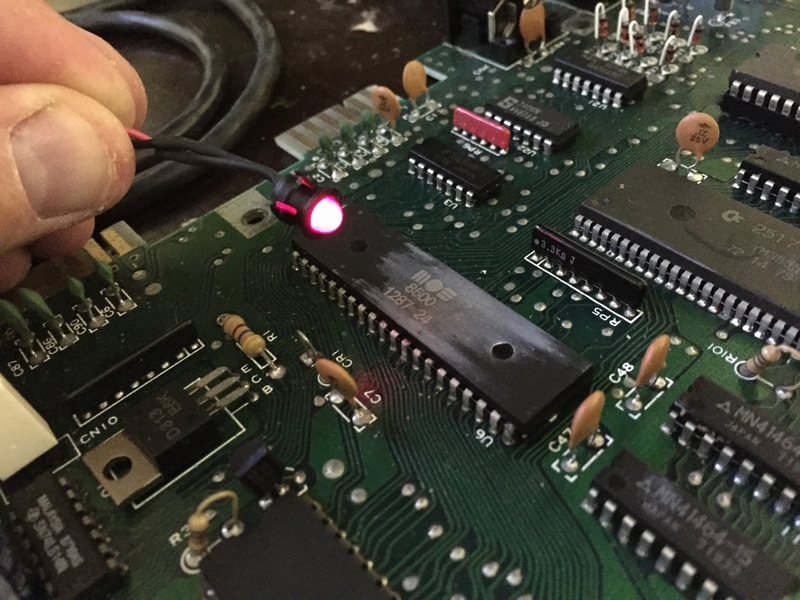 …and after swapping the second U11 RAM chip, the machine was brought back to life! 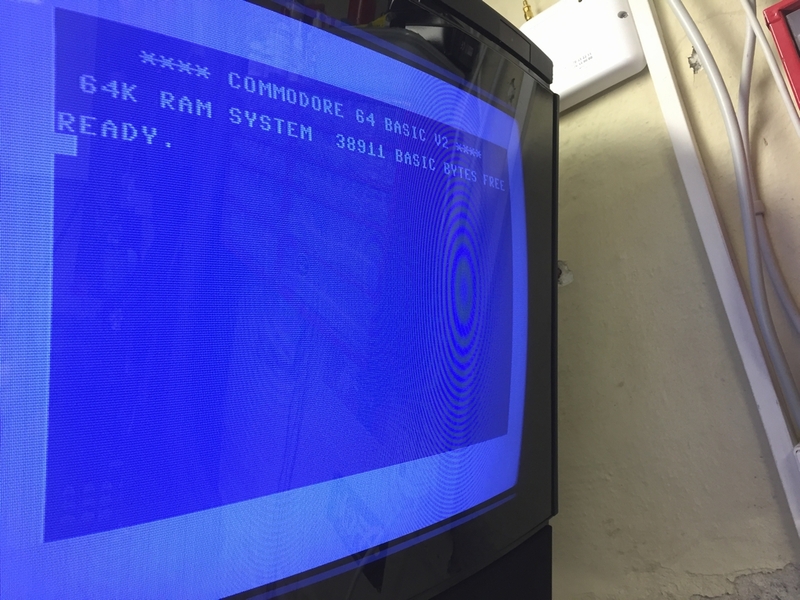 Sweet blue Commodore screen! 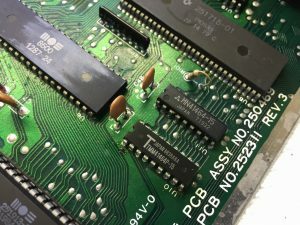 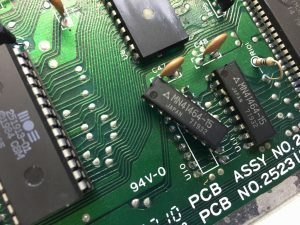 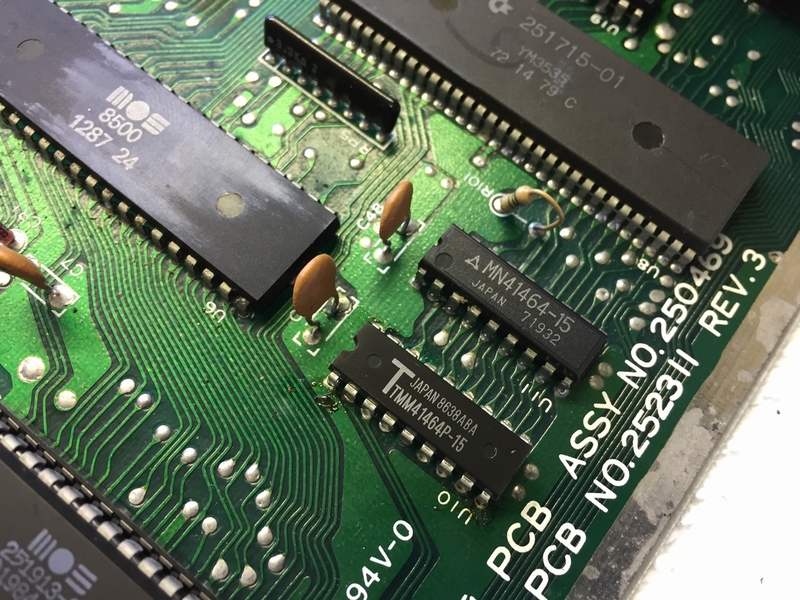 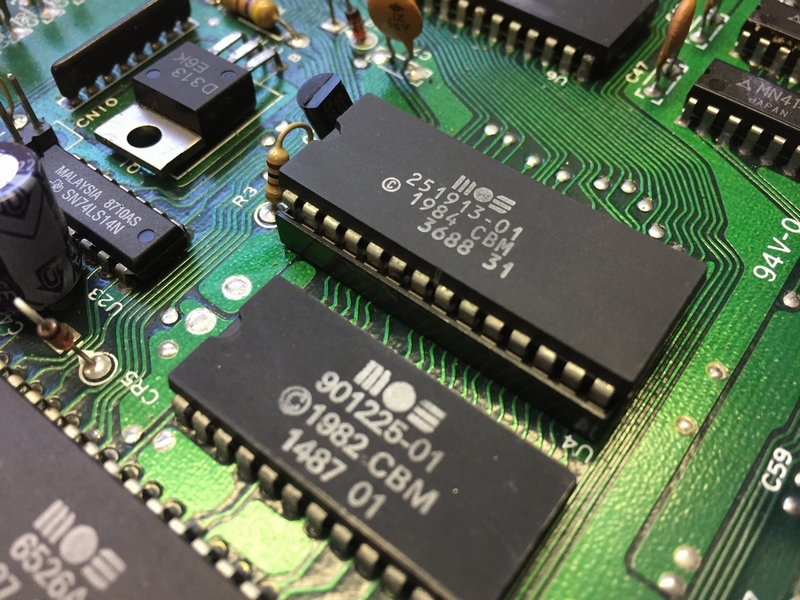 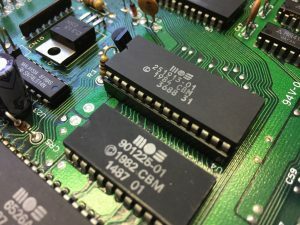 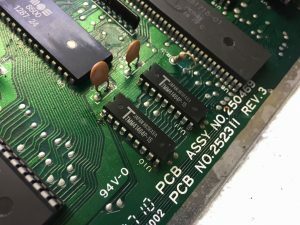 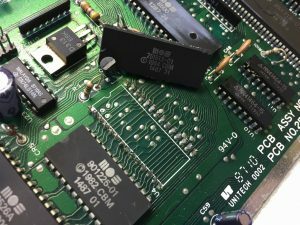 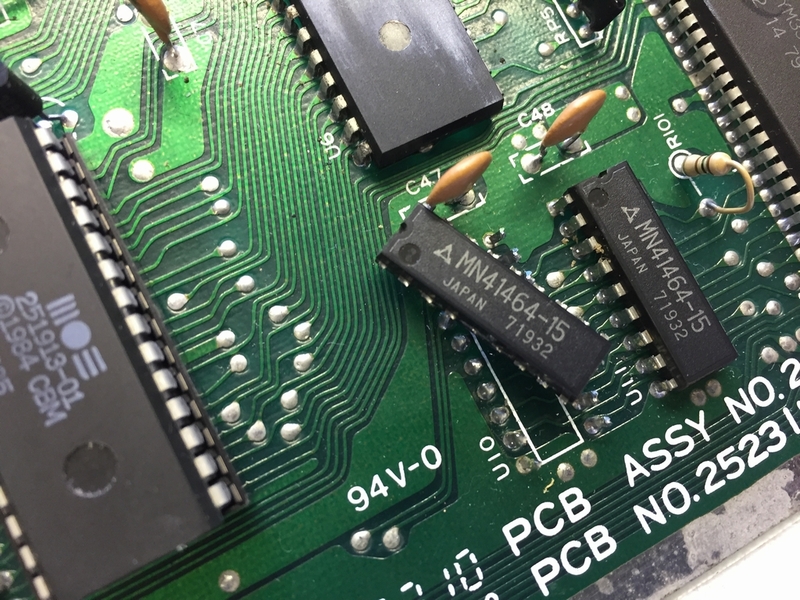 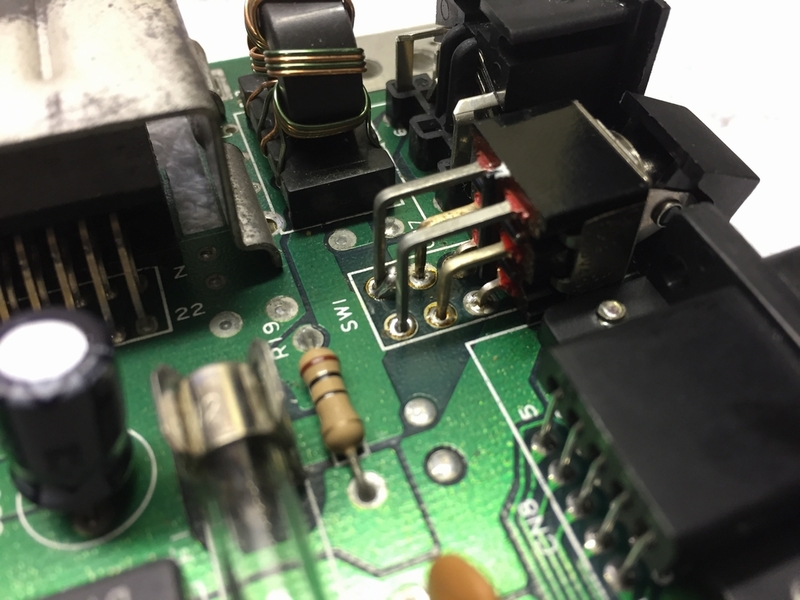 A new power switch, a new KERNAL/BASIC chip and two new RAM chips were needed to bring the machine back to life – my best guess is that a faulty power supply had fried the chips! Where do you get your power switches? I have a C128 with a very intermittent power switch I would love to swap out!